From 4.2 onwards Apache ActiveMQ allows you to communicate with a broker Command Agent to be able to perform administration queries and commands. This allows you to use the message bus itself to communicate with the message broker to list available queues, topics, subscriptions, to view metadata, browse queues and so forth. The broker will then have a command agent connected which will listen on the topic ActiveMQ.Agent. You can use the XMPP support to talk with the broker. 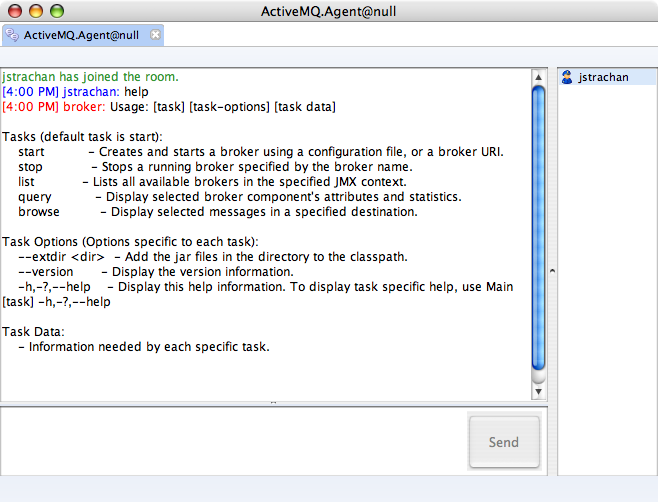 For example follow the instructions in XMPP to connect via a Jabber client, then just join the room ActiveMQ.Agent and talk to the broker! The activemq-core module has a simple Java class called SimpleConsole which you can run in your IDE to get an interactive console for communicating with a broker over JMS. Type in the various commands (or help to get more help) and the results are returned on the console.